A large delegation from Russia arrived yesterday in Brazil, ready to tour the country’s infrastructure, to learn about best practices for urban mobility. Representatives from the Russian Ministry of Transport, researchers, and municipal Secretaries of Transportation will tour Brazil in search of inspiration and an exchange of ideas. Like Brazil, Russia is preparing to host major sporting events that famously require drastic improvements to transport infrastructure – the Winter Olympics in 2014 and the World Cup in 2018. Under the leadership of The World Bank and with the support of EMBARQ Brazil, the Russian delegation will visit three of Brazil’s State capitals: São Paulo, Curitiba and Rio de Janeiro. These three cities are often looked to as leaders in mobility for Brazil. Now, they are paragons for Russian cities as well. These cities have particularly exceled in the implementation of high-capacity sustainable transport solutions. The Russian delegation is visiting the Bus Rapid Transit TransOeste in Rio, and the Expresso Tiradentes, in São Paulo – models which Russia may use as a guide when they make their own investments in sustainable transport. 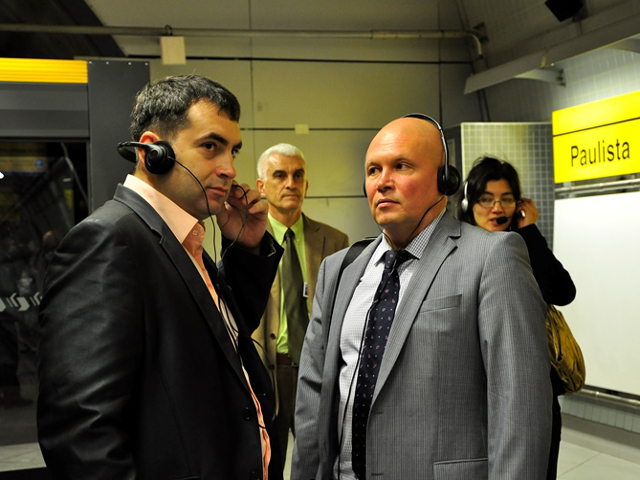 Vladimir Lugovenko, the Ministry of Transport of Russia, and Igor Titov, Director General of the Institute of Scientific Research in Transport Motor take a tour of Sao Paolo. Photo: Mariana Gil / EMBARQ Brazil. In meeting with both public and private institutions that focus on sustainable transport, the delegation will discuss land use planning, intermodal integration, financing large investments in public transport – including public-private partnerships, and parking management. Also on the list, particular to Russia and Brazil, is discussions of how to prepare a for mega events, like the World Cup. In recent years, urban transport has been a priority for Russia. Currently, the government has invested in the National Project for Improvement of Urban Transport (NUTIP), which aims to improve the quality and efficiency of public transport. On August 12, at the end of the visit to Brazil, the Russian Government delegation will attend a workshop in Rio de Janeiro, in order to learn about Brazil’s new National Policy on Urban Mobility (Law 12.587/2012), which has been in effect since 2012. The law prioritizes public transport, promotes integration between modes and encourages non-motorized transport. The law also requires cities with over 20,000 inhabitants to prepare mobility plans that address, among other topics, accessibility. A fully automated train pulls in to Paulista Station in São Paulo. Photo: Mariana Gil / EMBARQ Brazil. 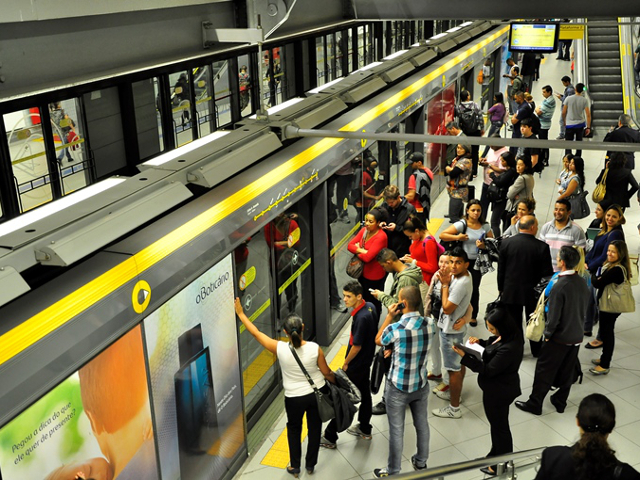 Yesterday afternoon, on their first day in Sao Paolo, the Russian delegates rode Sao Paolo’s metro Yellow line. The advanced, “driverless” line covers the Southeast-Southwest system and does not need conductors. “The automated system tends to decrease the chance of failure – [since] drivers are subject to drowsiness and other factors,” explains Laurindo Junqueira, one of Sao Paolo’s Metro experts who accompanied the group. As the Russian delegation continues to travel throughout Brazil, there will be many opportunities for an exchange of ideas. Though facing different landscapes and drastically different population trends, these two countries are both working to improve their transport infrastructure in innovative ways. With mega-events acting as the impetus to make much needed changes, these countries are working together to move their cities forward. This post is based on two posts originally published in Portuguese on TheCityFixBrasil. There, you can follow the Russian delegation’s progress as TheCityFixBrasil accompanies them to all three cities.